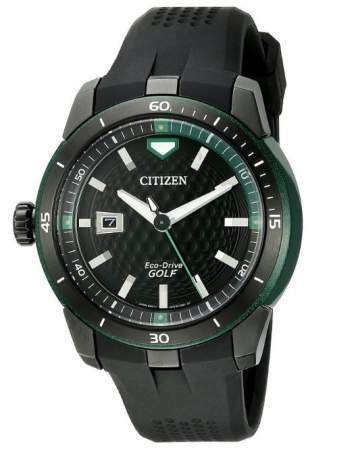 This Citizen Eco-Drive watch features a face and band with golf-ball-like dimples. Note that the crown is on the left side for this right handed watch. That keeps it from potentially bruising the back of the hand when the wrist flexes. The Eco-Drive is a solar panel in the watch that keeps the battery charged. I have several Citizen watches and really like them.